Natural News founder/editor Mike Adams, the Health Ranger, has been a trailblazer in the field of citizen science, natural and alternative medicine, and as all trailblazers know, having no shortage of detractors just comes with the turf. But Adams has never minded the criticism because Adams is also accustomed to being proven correct. Like this one. A couple of years back, using contacts he has cultivated over the years, Adams reported a blockbuster: The U.S. had used a high-tech “space weapon” against Beijing for devaluing its Yuan and causing economic turmoil in America and throughout the West, as evidenced by a mysterious explosion in the industrial city of Tianjin. The Tianjin explosion was waged as an act of “kinetic retaliation” by the Pentagon in response to China’s currency war Yuan devaluation, according to dissident sources from mainland China. The Chinese government has put in place unprecedented secrecy surrounding the mysterious explosion, and aggressive police state tactics are now being invoked to control the flow of information surrounding this event. The Chinese government’s official explanation for the explosion, which has now killed 114 people, is a complete whitewash. 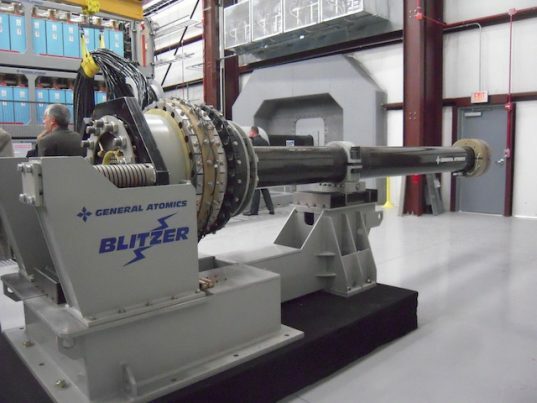 So, at least since 2013, the U.S. military has not only had a kinetic weapon of the type Adams mentioned, but the weapon has also been tested. But how long have such weapons actually been around? As Adams pointed out, a so-called “Rod of God” kinetic weapon is space-based – and was reportedly the one used to level six city blocks in China as a warning not to crash the global economy. Other analysts said that the weapon was deployed by the Air Force’s secretive X-37B Space Plane (“X” is the designation for experimental), which has been sent on a number of classified missions, leading to much speculation about its purpose and intent. Clearly, Adams was not off-base when he wrote his report two years ago; the U.S. is developing space-based kinetic weapons and may well have used one against China to enforce a global policy: Don’t tank the world economy.